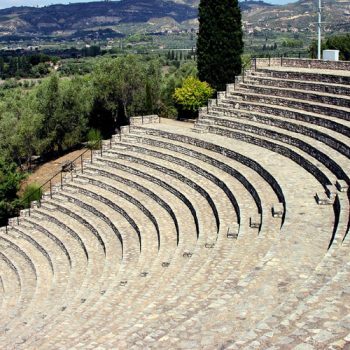 The Theatre of Ancient Olympia (Floka theater) is found 3 km to the west of the archaeological site, close to Flokas village. 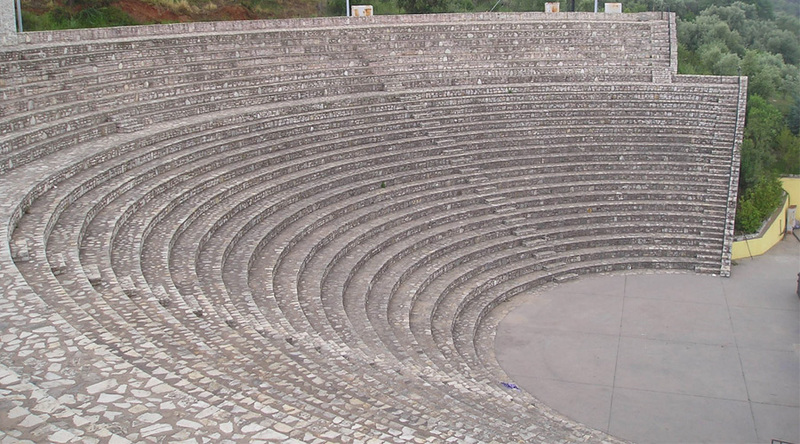 This theater is built amphitheatrically according to the modern design of an actual theater. 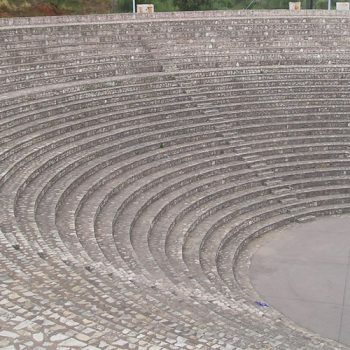 The seats and the rows are made of stone keeping an ancient constructed essence, with view to a round orchestra. 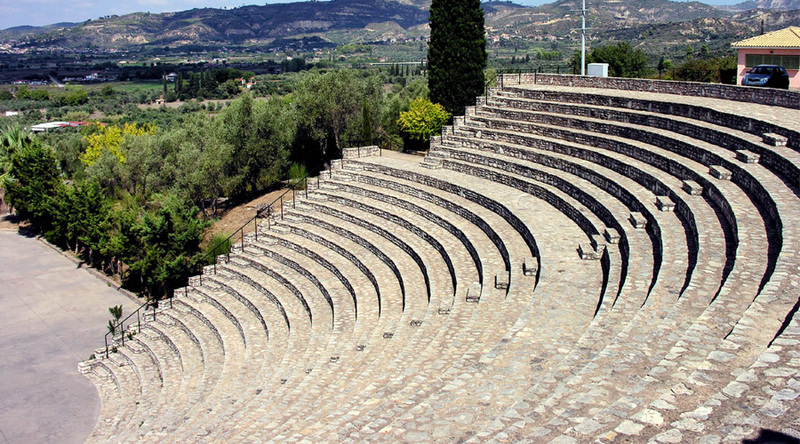 The theatre is open and hosts many plays, concerts and other cultural events in summer. Especially during summertime from July until August a festival is being organized hosting many famous greek and international actors and singers. The view from the theater to the valley is magnificent which makes it a great spot to take photos. The cruise visitors have also the chance to take panoramic photos with the cruise ship as the port of katakolon is visible from the upper seats. We will be happy to answer any questions regarding our services and your travel in Greece. Our female driver was a good guide and driver. We saw Klio's Honey Farm which was charming, the monastery, a retreat, other viewpoints, and a small olive manufacturing place. It was a beautiful day for a beautiful drive. We enjoyed it very much. We had an excellent day in Olympia. We enjoyed the tour, lunch, the wine tasting and the entire experience. We highly recommend taking this tour. It was wonderful to tour this little slice of Greece with Andrew's Katakolon Taxi service. Our guide Fotis was punctual, polite and informative. I think the highlight of our tour was Klio's Honey Farm, not so much because honey farming is that interesting to us, but rather because Klio herself was such a marvel. If the best travels are those where we make contact with locals and share in their world, then Klio and her honey farm are a traveler's delight. Dear Andrew, I just want to thank you again for your kindest hospitality during our short stay in Katakolon. Starting from getting in contact with prompt email reply, on time pick-up, cruising with brand new minibus and just Greek friendliness from your side, the whole trip was simply fantastic. An excellent day trip in Katakolon with Andrew. We particularly enjoyed the visit to the Honey farm and the monastery. Andrew speaks excellent english and gave a very interesting insight into his region's history and traditions. We highly recommend this tour to anyone stopping in Katakolon during a cruise. Thanks again Andrew for a lovely day. My wife and I enjoyed a day spent with Andrew. Amazing time stopping for honey and even at his house for olive oil. Was on time to pick up at port and very knowledgeable. Would highly recommend a tour with him. Alex and Ionnis were fantastic! Our cruise wasn't on time and I was worried, but they knew how to deal with it and were waiting for us, and didn't charge us extra. They were kind and professional and treated us like Royalty. This is MUCH better that booking with the cruiseship. We didn't have to wait and went where we wanted, when we wanted and it was about 1/2 the price. We texted Andrew approaching port from our ship enquiring about a taxi. Nothing was a problem, by the time we disembarked his service was waiting. Took the time to help us get tickets to Olympia and waited for us. Highly recommend. Great service, very friendly knowledgeable staff. Booked this service through the internet. Not only it was very reasonable in its price, but it was excellent. Nancy was waiting at the dock and was very knowledgeable on all things in the area. One person in our group had mobility limitations, and she talked our way to inside the attractions to vastly minimized the walking distances. Just excellent. There is no better way to check out Katakolon than being shown the way by Andrew. We had the pleasure of being with Andrew during a day trip from NCL (Cruise). In addition to some sight-seeing, Andrew drove us to an olive oil/wine farm for a wonderful taste of local produce and also to an authentic greek restaurant for an awesome meal. We would have loved to hang around with Andrew for a few more days. We docked in Katakolon for just 8 hrs as part of our cruise holiday. Just a quick phone call and John arrived to look after us, and he did a great job. He went the extra mile to make our trip memorable and couldn't have been more hospitable. Thanks so much. Very highly recommended. My husband and I visited Olympia as one of our cruise stops...I am a keen photographer and wanted to see as much as possible in our 6-7 hours in Olympia...Andrew tailor made our touring experience and we visited historical sites such as the Olympic village and museum and a monestry then explored the countryside and industry and went to see where and how the locals lived and enjoyed their coffee.. Andrew is a passionate and knowledgeable guide and we would have no hesitation in recommending him. When we disembarked from the ship we were met on time by Andrew. He was very kind and proffesional. He took us to Olympia, Olympia Land winery and the monastery. Along the road he he was very informative and eager to tell us about the area. This was a very enjoyable 4-5 hour trip. I highly recommend Andrew Strathopoulos and Taxi Katakolon. Rather than booking a tour with the cruise we were on, we searched Trip Advisor reviews, emailed Andrew and chose to go with a private tour. It was the best decision as Andrew is very informative, friendly and personalises the trip to suit your needs, we were able to fit everything in we wanted to do, and were very impressed with how organised, professional and how welcome Andrew made us feel. Thank you Andrew for a great day! We discovered this possibility on Tripadvisor. I came highly recommended. And they were right. We were on a cruice, and instead of being on a bus with a large group, we could relax in a nice Mercedes, and ask to go where we wanted. Andreas was a very reliable and pleacent driver. With 4 people we got a tour that was far less expensive compared with the cruise trip. Don`t think about it. Just go for it - and use email booking. Our short stay in Olympia was an outstanding experience made the better because of our driver. It all started when I discovered our ship was arriving an hour earlier and departing an hour earlier than planned. Our driver was already waiting for us at the earlier time and they adjusted for us. He was very knowledgeable, friendly, and flexible to our desires. At our request he pre-arranged a tour guide to meet us at Olympia and just made the entire experience great. I wholeheartedly recommend. I had emailed Andrew with our arrival dates. He set up to have John pick us up at the cruise terminal. John was incredible and very knowledgable. He took us to Olympia and the surrounding sites. He explained the history of the area and also updated us on the current history He made our trip to Olympia very memorable. He even stopped and bought us a gift of delicious baklava. We would recommend Andrew and his service. I have been organizing and transporting tourists from Katakolon to the best touristics hotspots of our Perfecture over 20 years. I have the privilege to communicate easily in English as my abroad experience has given me the chance to speak foreign language so this gives to the customer the opportunity to have a pleasant transportation to the destination.